Reading App Builder 2.0 has been released. including significant speed improvements for Windows users, cutting the synchronization time by up to 50%. 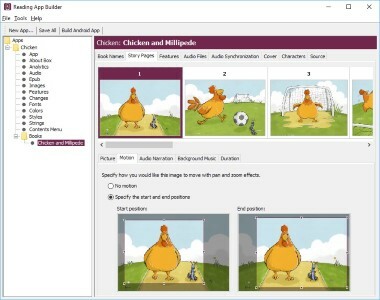 Improvements to Picture Story books with pan/zoom motion, background music, subtitles and landscape view. Illustration resizing: resizes images to contain in app to reduce app size. Audio clips: you can insert short audio clips to be played when the user taps on a word, phrase or image. App Publishing Checklist: Is your app ready to publish? For more details about all the enhancements and fixes in RAB 2.0 please see the Release Notes. Go to Download for the updated install program and Resources to access the documentation.